After the hustle and bustle of the holiday season we turn to one of our favorite times of year, Awards Season. The Golden Globes, the Academy Awards, the Grammy Awards are big favorites here. In keeping with the Season we would like to congratulate the 9 Heartstrings Bred Dogues who earned AKC Titles in 2016 as well as their owners! Every puppy bred here is bred with much heart, love and hope. We are proud of every single puppy we have produced but we really must acknowledge these babies and their owners. There is a saying that you get 10% out of your Dogue in competition that you get in practice. There is nothing, nothing easy about earning and AKC Title. Classes, practice and just a lot of good old fashioned hard work is what that piece of paper represents. Many days it doesn’t go the way you had hoped and you go home, practice more and do it again. This is a tribute and honor to your Dogue. He or she is now forever recorded in history as an AKC Titled Dogue. 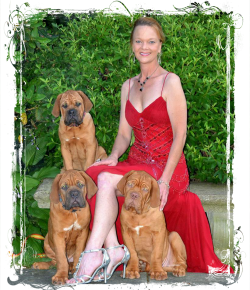 It is a labor of love, honor and respect to your Dogue. Enormous congratulations to our 2016 Champions. Most of all, congratulations to their Families of Champions. You can feel great about your hard work and accomplishments. Thank you all for making us so very, very proud!